Once more, Mikita Badziakouski reached out for perfection. 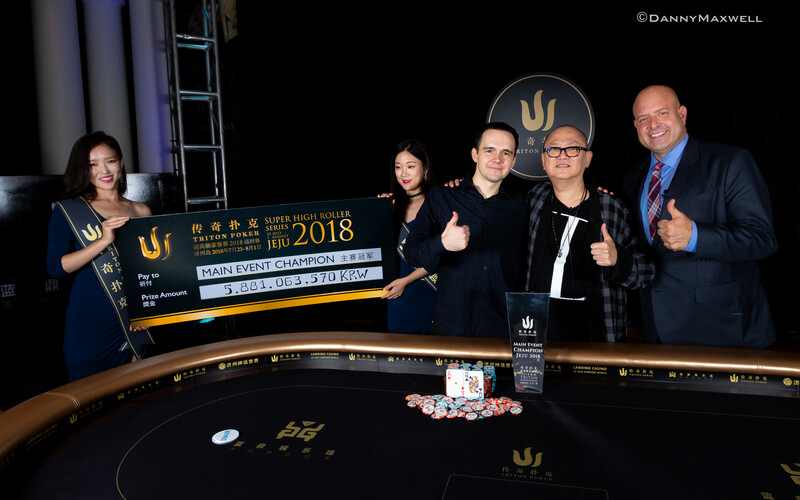 After claiming the throne three months ago in Montenegro, Badziakouski returned to the Triton Super High Roller Series in Jeju, South Korea. 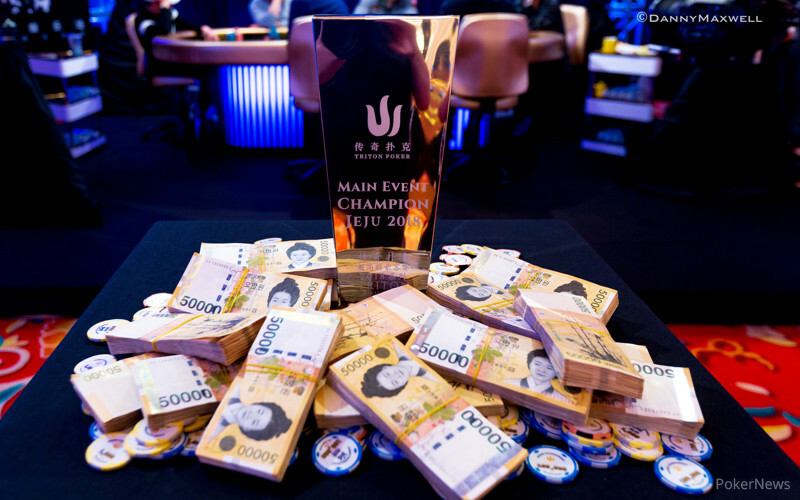 He left the Main Event field behind again, topping the 55-entry competition for an astonishing payday of HK$41,250,000. The top-prize equals more than $5.2 million and comes down as the fourth-highest amount of money ever awarded in a tournament held outside of the World Series of Poker. "I'm feeling great. Usually, you're really tired after a hard tournament so the most joy is coming in the next days," the champion said. Badziakouski masterfully navigated his way to a back-to-back victory with his typical robotic approach which helped him to reach the pinnacle of the high stakes tournament poker. Badziakouski doesn't feel the pressure in big moments and that's a valuable tool when it comes to playing for millions of dollars. "This is obviously the biggest score but, at the same time, there is nothing special about it. It's just about making good decisions, being a good player," Badziakouski said after claiming the title in Jeju. Badziakouski certainly belongs to the group of the world's best players. Not only that he has won over $16 million in live tournaments, but he's built his strong reputation in the high roller circles for his outstanding expertise on no-limit hold'em technicalities. "I think that has been the biggest motivation for me for a long time. Just to be trying to do my best and that's it," he said. There might be tons of players who chase higher rankings on various leaderboards including the all-time money list, but Badziakouski isn't one of them. His zeal doesn't come from that perspective. The bottom line for him is to play on the best possible level. "Every time you face a decision, you just want to do the best decision the theory tells you and that's it," Badziakouski said. Badziakouski knows that he needs to be doing everything in his power to maximize his success at the tables, but the results in poker don't always reflect the preparation. "You should try to get away from all emotions so it doesn't really matter. Big stack, short stack. You always work with what you've got." Here in the Main Event, Badziakouski was on the better side of the spectrum for almost the whole part. He bagged one of the top stacks at the end of Day 1 and then kept increasing his piles on the second day to claim the chip lead ahead of the six-handed finale where he was able to close things out. "In the end, it's mostly about the luck. Last month, I've been really lucky and that's the reason why I'm winning," Badziakouski simplified his recent successful runs. But the accomplishment matched his composure during the tournament. Badziakouski never stopped analyzing previous situations. He dedicated the breaks to studying previous hands, trying to get an extra edge over his rivals. The Triton Series boasts a lot of players Badziakouski is used to battle on a monthly basis but Chan Wai Leong might be one of the wild cards. While Badziakouski had already played against him at previous Triton events, the sample of their common hand history is likely much smaller than those he has with the likes of Sergio Aido, Jason Koon or Sam Greenwood. 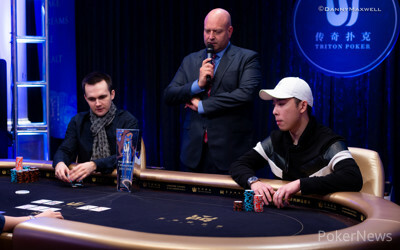 Chan was the only player who managed to trouble Badziakouski on the final table. Chan first found a lucky double with tens over Badziakouski's aces and then clipped the Belarussian again when he peeled pocket kings. Badziakouski wasn't able to get away from ace-queen with the nut flush draw on the turn and doubled Chan again while he dropped to a short stack himself. Badziakouski, however, would eventually get his revenge. Another major encounter against Chan would soon determine the whole narrative. They tangled in a battle of the blinds which started with Badziakouski limping with ace-queen. Chan checked and the board rolled out ace-high, pairing an eight on the river. Badziakouski got raised on the turn and called before firing a blocking bet on the river. Chan pulled off a massive bluff with air, shoving on Badziakouski who used all of his time extensions to figure out the pivotal decision of his tournament. Ultimately, he was able to call and double up. "Result is not necessarily proving that the decision was correct. 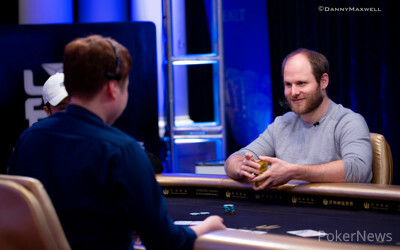 I felt like it was a spot where he could be bluffing and I had not that many chips so... just gamble," Badziakouski said. He expanded on what was his thought-process when he was facing the all-in bet. "On the rivers, it's usually very simple. Your opponent is either bluffing or value-betting. It's like one or two and there's no middle option. I was jumping between both of them and, in the end, decided to call. I was right and got lucky." After that crucial hand, it was a one-sided affair. Badziakouski dispatched Koon in fifth, Greenwood in fourth and then he took care of the Triton founder Richard Yong who bowed out in third place. He stormed to the heads-up with a 5-1 chip lead, taking on Chan again. Badziakouski didn't give him an ounce of space and the duel escalated when Badziakouski won a preflop coin flip. 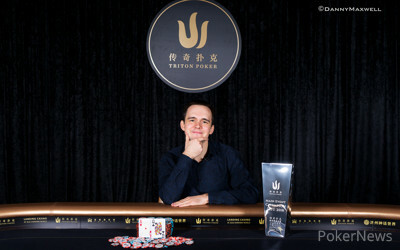 Chan settled for the silver medal and Badziakouski took home the largest prize of his career, scooping the second Triton Main Event in a row. "I'm really excited about it," Badziakouski said. Now with two remarkable titles under his belt, Badziakouski will surely pursue an unprecedented back-to-back-to-back victory so stay tuned to PokerNews to find out more about the future stops of Triton Super High Roller Series. Mikita Badziakouski raised on the button to 175,000 and Chan Wai Leong moved all in from the big blind for 1,885,000. Badziakouski called and the hands were turned on their backs. The flop of would give Badziakouski the lead and he would retain it on the turn as well as the river. With that, Chan would be eliminated from the tournament in 2nd place. For his run, Chan will collect HK$25,520,000 or roughly USD $3,251,184. Chan Wai Leong limped in for 80,000 on the button with , and Mikita Badziakouski checked in the big blind holding . The flop was and Badziakouski checked. Chan put out a bet of 80,00 and Badziakouski check-raised to 280,000. Chan thought for a bit, then just called. Both players checked on the turn then on the river, Badziakouski checked again. Chan put out a bet 250,000 and Badziakouski folded. Chan Wai Leong raised to 200,000 from the button with and Mikita Badziakouski called in the big blind holding . The flop was and Badziakouski flopped a straight. He checked over to Chan who put out a bet of 250,000. Badziakouski called. On the turn, Badziakouski checked again. Chan now checked behind. The river was the and Badziakouski put out a bet of 600,000. Chan folded to Badziakuski took down another pot. Mikita Badziakouski limped in with and Chan Wai Leong checked his option in the big blind with . The flop was and Chan checked. Badziakouski checked it back. On the turn, Chan put out a bet of 180,000. Badziakouski thought for a bit then folded, allowing Chan to take the pot. Mikita Badziakouski was in the small blind with and he raised to 200,000. Chan Wai Leong called in the big blind with . The flop was and Chan checked. Badziakouski put out a bet of 125,000 and Chan Folded. 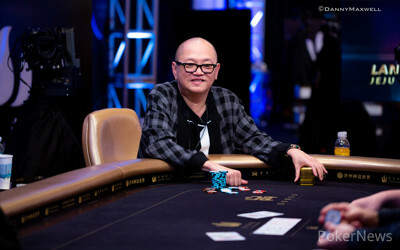 Richard Yong raised to 165,000 in the small blind and Mikita Badziakouski three-bet to 500,000. Yong moved all in for 1,945,000 and Badziakouski quickly called. Badizakouski was ahead and Yong wasn't able to pull ahead on the flop. The turn left him drawing to a queen but he wasn't able to spike any of his three outs as the river fell . Richard Yong was eliminated in third place, taking home HK$16,720,000 ($2.13 million) for his efforts. Badziakouski and Chan Wai Leong took a short break before the heads-up match. Mikita Badziakouski raised to 160,000 with and he was called by Chan Wai Leong in the small blind with . The flop came down and Chan checked. Badziakouski put out a bet of 150,000 and Chan called. On the turn, Chan checked again. Badziakouski checked it back and the rolled off on the river. There, Chan checked and Badziakouski checked it back. With his ace high he would earn the pot and chip up to nearly 10 million chips. Mikita Badziakouski opened to 160,000 under the gun and called off when Sam Greenwood jammed his last 525,000 out of the small blind. 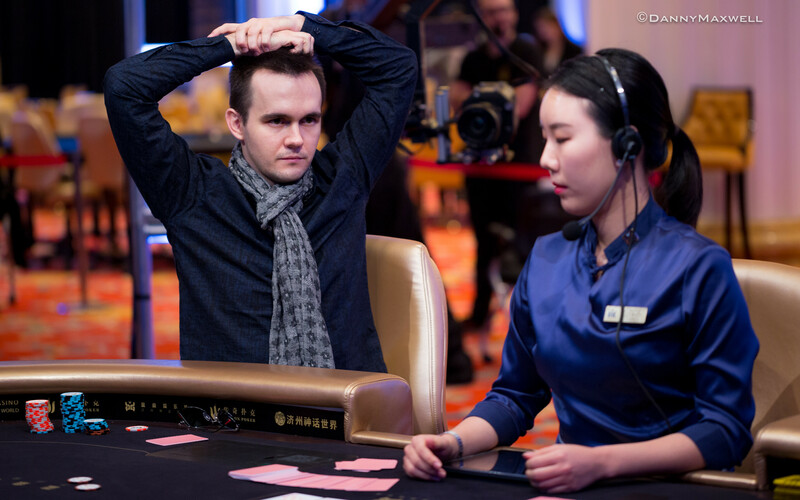 Greenwood had two live cards but he couldn't catch a piece of the and he walked away with a fourth-place prize of HK$11,550,000 (just under $1.5 million).